In a general sense, lacquer is a clear or coloured varnish that dries by solvent evaporation and often a curing process as well that produces a hard, durable finish, in any sheen level from ultra matte to high gloss and that can be further polished as required. True lacquerwork is Chinese or Japanese in origin. Varnish resin derived from a tree indigenous to China, species Toxicodendron vernicifluum (formerly Rhus vernicifluum, Rhus verniciflua), commonly known as the varnish tree. These lacquers produce very hard, durable finishes that are both beautiful and very resistant to damage by water, acid, alkali or abrasion. 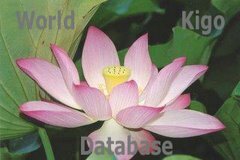 The contemporary theory held that from China, knowledge of lacquer technology was introduced to Korea, and from there to Japan. It was believed that Japan had also been using lacquer from ancient times, but the systematic process of application was developed by the Chinese. With the discovery of lacquer ware in Japan dating back to Jōmon period, conflicting theories claim that technology may have been independently developed in Japan. Trade of lacquer objects traveled through various routes to the Middle East. Known applications of lacquer in China included coffins, plates, music instruments and furniture. Lacquer mixed with powdered cinnabar is used to produce the traditional red lacquerware from China. The trees must be at least 10 years old before cutting to bleed the resin. The sap is poisonous and causes extreme rashes. The trees grow up to 20 m tall with large leaves, each containing from 7 to 19 leaflets (most often 11-13). The sap contains the allergenic compound urushiol, which gets its name from this species' Japanese name urushi (漆). Urushi is a very strong adhesive. 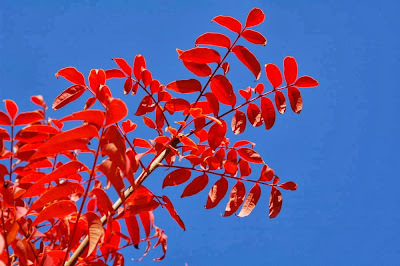 The leaves, seeds, and the resin of the Lacquer Tree are sometimes used in Chinese medicine for the treatment of internal parasites and for stopping bleeding. Compounds butein and sulfuretin have antioxidative, and aldose reductase and advanced glycation endproducts inhibitory effects. no urushi 野漆 (のうるし) "wild laquer"
suzuburibana 鈴振花（すずふりばな）"flower with swinging bells"
Euphorbia helioscopia is a species of spurge native to most of Europe, northern Africa, and eastward through most of Asia. These plants are NOT related to the laquer tree, despite their Japanese name. This is a job of specialists, making insertions in the tree bark and scratching the liquor bit by bit, over many weeks in summer. They used to make good money in olden times, but now with chemicals, are almost out of their jobs. Some rural communities are trying to revive the laquer tree plantations and the use of "true" Japanese laquer for art. 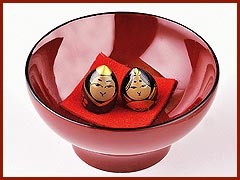 In the story about Wakasa Laquer, more Daruma figures are introduced.
. Hita urushi日田漆 laquerware from Hita . うるしコーヒー urushi koohii, "laquer coffee"
The fruit of the tree has a lot of wax particles, which can be extracted and make candles too. After extracting the wax, the beans are dried and then used for drip coffee. 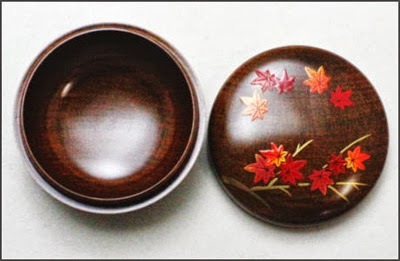 Designated a traditional craft of Iwate Prefecture, Hiraizumi’s Hidehira-nuri lacquerware has been widely manufactured in Japan. Its simple, refined aesthetic presents a reflection of the history and natural features of the region of its birth. ..... Production of Hidehira-nuri can be divided into four steps.